Do you know who was the photographer of this portrait? This is a photographic negative of Noah Phelps. It is a portrait photograph showing Phelps from the torso up. He is turning his head slight to the left. He is wearing a a dark-colored coat, vest, a light-colored shirt, and a bow tie. Phelps was one of the founders of the Ontario Methodist Camp Ground which became Grimsby Park. 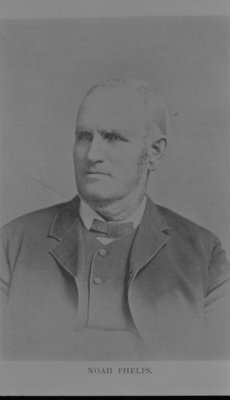 He was elected the first president of Grimsby Park in 1874 and remained president until his death in 1900. He also served as Postmaster of the Grimsby Park post office. He was an ardent supporter of temperance, Methodism, and the Chautauqua movement.